When you arrive in the Granite Cave, a hiker will give you HM05 (Flash). This will help you see in the darker lower levels of the cave; it also reduces the opposing Pokémon's accuracy in battle. However, if you don't have the Knuckle Badge, you won't be able to use it outside of battle. Head west and grab the Escape Rope, then go down the nearby ladder. 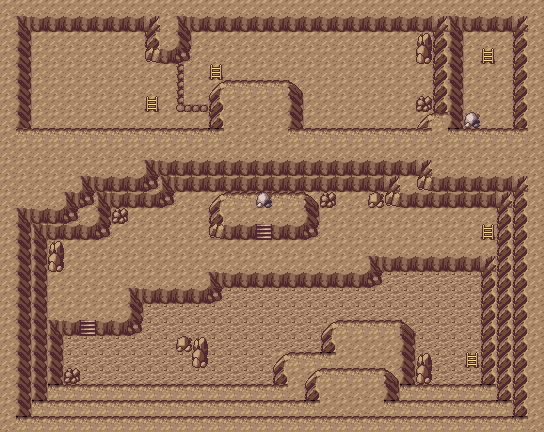 On the next level, search the passage south of the slippery sand slope for a Poké Ball. In the bottom right corner, go down another ladder. On the third level, head west to find some stairs. Go north, then move east to find a ladder. Be sure to check the white rock on top of a small raised platform to get an Everstone. Go up the ladder, then up a second ladder. 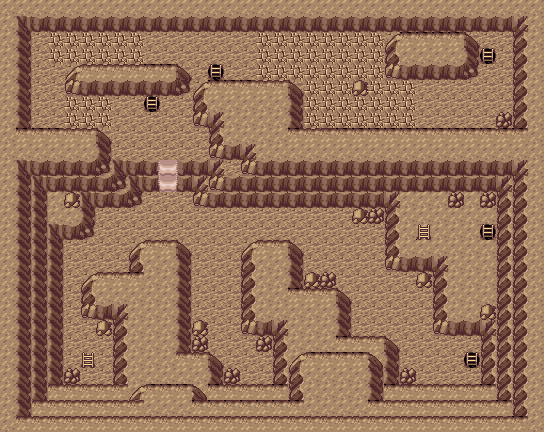 Back on the main level, head west and you'll find a cave entrance. Inside is Steven Stone. Give him the letter, and he'll give you TM47 (Steel Wing), a Steel Type move that deals damage while possibly increasing your Defense. If you have a pokémon with Rock Smash, smash some rocks and a Nosepass should turn up. Once you get the Mach Bike, you should return to the second floor of Granite Cave. Go to the slope that you couldn't walk up. Your Mach Bike will easily be fast enough to ride up the slope, granting you access to a new area of Granite Cave. Once you're up, go down the ladder for a Repel. Climb back up and ride your bike across the cracked floors until you touch the wall. Don't stop halfway or you will fall to the floor below and will have to climb back up. Go all the way up the wall and go past the second set of cracked floors until you reach the second ladder. This ladder acts as a checkpoint, so if you fall through the floor you can try again from this ladder. The final set of crumbling floors are a little tricky. You must go right, down and right without hitting anything, or you'll lose your momentum and fall back down. 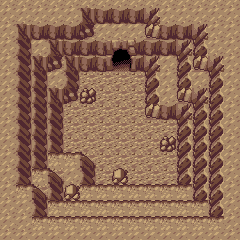 Once you've past this stretch of floor, go down the final ladder for a Rare Candy as well as an Everstone hidden inside the white rock. Zubat really should get more love, and this is your chance to make up for calling it all those mean names in Pokémon Red, Blue, Yellow, Gold, Silver, and Crystal. Why's that, you ask? Because Zubat's evolution Golbat (level 22) will only evolve when it loves you as a trainer. Why do you care? Because Crobat is an incredibly agile and powerful Pokémon. Zubat has, admittedly, always been plagued by poor move sets, but at level 6 it already knows Leech Life and Supersonic. Not sold? Then pay attention; at level 11 Zubat picks up Astonish, a move that may cause flinching. Ok, he's still pretty weak. In fact, Zubat's true strength only begins to show at level 16 with Bite and level 21 with Wing Attack. It's an incredible stretch, but if you power-train a Zubat you can wipe out Brawly's gym and even add to Zubat's happiness points with your victory. You got me. I just love the suckers. Geodude, the combination Ground/Rock Pokémon. With a high defense and decent attack set, Geodude makes a good addition to your team in the early and middle parts of the game. It evolves into Graveler at level 25, at which point you can trade it (Much like Kadabra) for an instant boost in stats and no penalty on attack levels. In Geodude's arsenal are strong, useful attacks like Rock Throw at level 11, Magnitude at level 16, and even Earthquake at level 36. If you rather enjoy blowing your own Pokémon to bits, the Geodude line is also quite skilled at Explosion-moves. Unfortunately, it gets defensively out-classed by Aron who is readily available one floor down. As a bulky pure fighting type, Makuhita happily plays the role of tank on a team requiring more stall. He evolves at level 24 into Hariyama, a hard-hitting sumo wrestler! His trademark attack this early on is Arm Thrust, which throws several punches at the foe, similar to Fury Swipes. What makes Makuhita difficult to use, however, is his lack of body behind his attacks. At higher levels, with some TMs (Earthquake, Brick Break, and Strength to name a few) Hariyama is not a bad choice for a Pokémon. But you may want to simply wait until you get to a point in the game where you can devote that kind of money to a monster. Aron, Aron, the bastion of doom unto Normal-typed Pokémon. With Steel/Rock typing and high defense, physical attacks outside of Fighting and Ground type attacks (Quite rare within the early and mid-game) can hardly touch this guy and his evolutions. At level 32, you can evolve Aron into Lairon, and again into Aggron at level 42, both of which are strong Pokémon. Aron learns attacks of a defensive nature like Iron Defense at level 17, Roar at level 21, and Protect at level 34. Offensively, he is out-classed by the likes of Geodude and Makuhita until you drop some TMs on him. If you haven't used Rock Tomb this isn't a bad time to use it. Players in Emerald and Sapphire are treated to an oddity in the Pokémon world. As a Dark/Ghost type, Sableye has no weaknesses. That's right, in addition to its Fighting and Normal immunity, not a single one of the attacks in existence will hit Sableye for super-effective damage. Of course, there is a downside to this in that Sableye has no true strengths. Even without weaknesses, most attacks later in the game can 2 and 3 hit kill this charming fellow. However, early on, his tricky skills might be made useful in the Dewford Gym... Moves like Night Shade at level 9 and Astonish at level 13 might keep opponents off-guard long enough for you to wipe them out. Ah, but the Ruby players shouldn't be sad about missing out on Sableye. They are treated to Mawile, the scary-cute and tricky Steel type. It has an incredible Attack and Defense stat for this early in the game, though it may be hard to see under it's special move set. never fear, for at level 21, this dangerous beauty learns Vicegrip and all shall be made clear. Emerald players can also catch her on Victory Road, so no need to fret catching and training a Mawile here and now if you're feeling patient. Oddly enough, She never naturally learns any Steel-type moves outside of Iron Defense at level 41... So strange. This page was last edited on 27 November 2018, at 05:56. This page has been accessed 348,204 times.